It's that time of year again - TIME TO GET SPOOKY! From blood spattered cookies to zombie brains and spider legs, tis the season for all things disgusting. While these Halloween themed recipes might look gross, they are all actually pretty tasty, once you get past their grotesque appearance. Just like Jeffery Dahmer, you won't be able to eat just one! 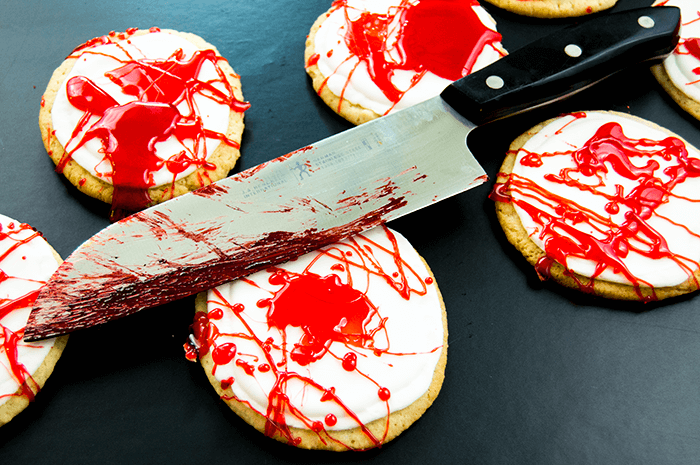 Spattered with sugary blood, these creepy cookies are perfect for your friends obsessed with true crime and murder. If you're scared of spiders, this is the perfect appetizer for you - spider legs dipped in spider 'blood!' Actually, made entirely of bread and cheese, the bloody center is made from pizza sauce, perfect for dipping the legs and other spooky bits in. If you thought the season seven premiere of The Walking Dead was bad, just wait until you can make your own bloody, zombie mess in your very own kitchen! My first ever Halloween experiment - BRAIN CHEESE! Using a leftover brain shaped mold meant for making Jell-O, this disgusting looking brain is actually a cheese ball waiting to be ripped apart. It wouldn't be Halloween if the spooky treats from Harry Potter weren't mentioned at least once! Transform into your favorite witch or wizard with this simple Polyjuice potion, made with Muggle ingredients. One of my very first video recipes, for simple NO BAKE cake pops - for those scared of the kitchen!